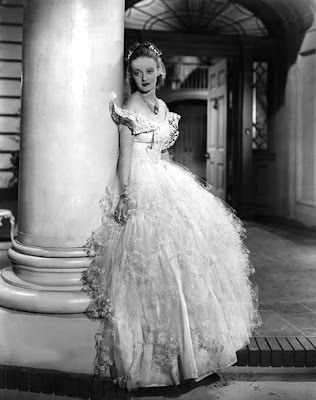 I have always been enchanted by the virginal white gown worn by Bette Davis in her Southern movie, Jezebel. Its voluminous layered skirt edged with lace detail creates a cloud on which the bodice stands, fluttery shoulders of lace move down the front. 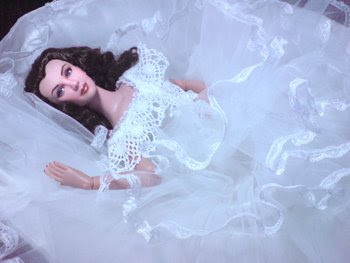 I thought this a nice gown for Tonner Scarlett which I had just recently attempted to repaint. 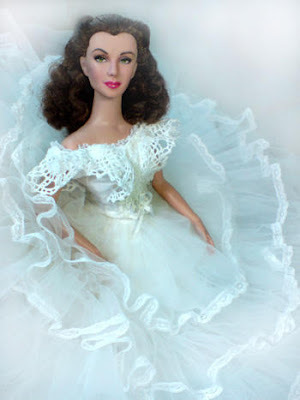 My best bet was one who loved GWTW dolls, enjoyed sewing and had the patience for detail. And so I found myself approaching Alana Bennett (www.dollfashionsbyalana.com). 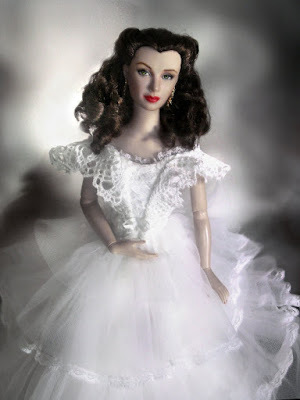 What you see are her re-creations of the Jezebel white gown. The layers are not as much but what is important is it captures the look of the dress. This is also my first repaint -- my first attempt. 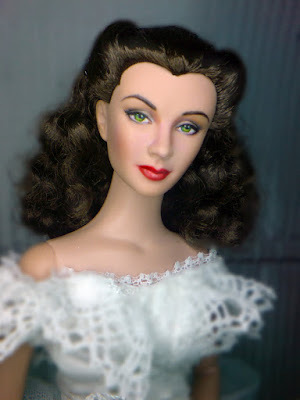 I repainted on the existing factory paint of the Tonner Scarlett doll. I had no 20/0 brush and no magnifying lamp. An very tedious task indeed. Doll in between legs, magnifying glass in one hand, paintbrush (the smallest available) was how the repaint was done. 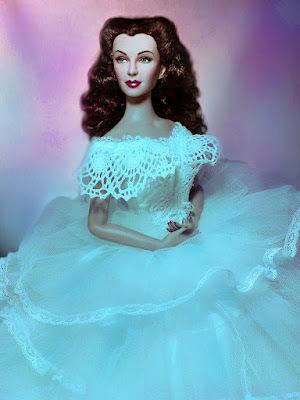 After this doll, I think I found the gumption to proceed with a complete erasure of factory paint on my next Scarlett doll. It was daunting considering the dolls are pricey. It was also very enriching, as you discover the process of repainting -- thru hit and miss. Well, here she is, The Jezebel White Gown by Alana Bennett! Enjoy the pictures.